Girls spring soccer meeting has been rescheduled for Thursday, May 2nd. Summer Dual Credit Courses: Registration is open for summer courses online or at the University Center. Many of these courses start on May 13th!! If you plan to take a course over the summer, we should start the application process. Please see Mrs. Bigge if you have any questions about this. Reminder- these courses are $48.33 per credit, most at worth 3 credits, so the cost is approximately $150 before books/materials. Deadlines Approach!! Starting on Monday, March 4th the new grab-n-go kiosk will be open during the lunch periods. This kiosk will have cold sandwiches and salads along with the other food items needed to make up a meal. The kiosk will be just like going through the main lunch lines. You use your ID to access your account or you can pay cash. You will need to have 3 food components, with one of them a fruit or vegetable, to purchase a meal. The sandwich has 2 components, a grain/bread and a protein, so you will just need a fruit or vegetable to complete the meal. The salads have 2 components, a vegetable and protein, so you will need either a fruit or a milk to complete the meal. A meal can include up to 5 individual components – protein, grain/bread, fruit, vegetable or milk. Just like at the main lines you will be charged for any 2nd items purchased. If you have any questions please ask the staff there for clarification. No items will be sold ala carte or separately. You will have to purchase the necessary items to have a full meal, just like at the main lines. We are starting out small with the choices at the kiosk and will be expanding them as we go along so keep your eyes open for new items! SENIORS: Need to Pay for College??? 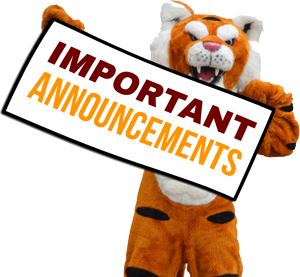 Be sure that you are periodically checking the counseling group under resources and then scholarships for constant updates. Just put on a link that's connected to 900 scholarships being given in SD only. New ones are constantly being posted as they come in. Keep checking to get the cash! Boys Soccer Open Gym will be held on Sundays from 6:00-8:00pm at the South Middle School Gym.